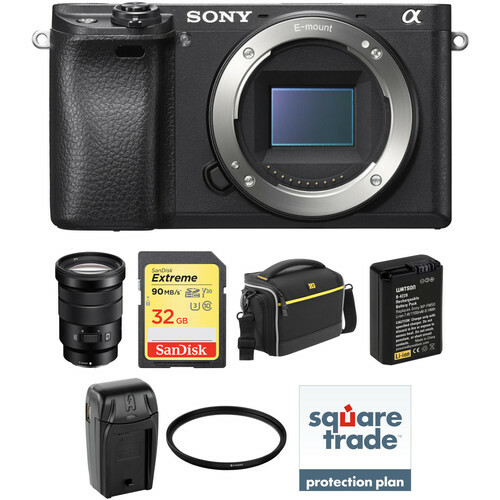 Comprising everything needed to begin shooting, the black Sony Alpha a6300 Mirrorless Digital Camera with 18-105mm Deluxe Kit from B&H bundles the versatile mirrorless body and standard zoom E PZ 18-105mm f/4 G OSS lens with a memory card, a camera bag, a spare rechargeable lithium-ion battery, an external battery charger, and a UV filter. Additionally, a two-year drops and spills warranty is also included for further protection to your equipment. Fast-focusing and 4K-shooting, the black Alpha a6300 from Sony is a versatile APS-C-format mirrorless digital camera designed for multimedia image-makers. Revolving around a redeveloped 24.2MP Exmor CMOS sensor and BIONZ X image processor, clean image quality is provided with a wide expandable sensitivity range to ISO 51200, along with accelerated readout speeds for internal 4K30 and Full HD 1080p120 video recording with full pixel readout. Stills shooters also benefit from the apt processing speed, which enables continuous shooting at 11 fps for up to 21 raw frames in a burst, as well as 14-bit raw file output. Complementing both stills and video, the sensor and processor combination also avails 4D FOCUS, which combines a wide-coverage 425-point phase-detection system with a 169-area contrast detection system for quick and precise focusing performance. This focusing system also enables High-density Tracking AF for more efficient and accurate tracking of moving subjects across the image frame. A well-rounded camera for both photographers and videographers, the a6300 is characterized by its speed and further qualified by its refined image and video quality. Have all the essential focal lengths covered with this E PZ 18-105mm f/4 G OSS Lens from Sony. Designed for APS-C-format E-mount cameras, this lens offers an extremely versatile 27-157.5mm zoom range and has a constant f/4 aperture for consistency through all focal lengths. Making this lens a great choice for both stills and video is the implementation of a power zoom mechanism and Handycam technology that provides smooth, quiet zooming and focusing. Also, it uses two extra-low dispersion elements and three aspherical elements to combat aberrations for crisp, clean images. On top of these features, the lens is equipped with Optical SteadyShot image stabilization to help reduce the effects of camera shake, especially at longer focal lengths. The lens benefits from an internal focus design that ensures that the overall length of the lens does not change during focusing. Additionally, it offers a minimum focus distance of 1.5' and uses a seven-blade circular diaphragm for smooth bokeh. A versatile mid-range zoom for APS-C-format E-mount cameras, this 18-105mm lens provides a wide-angle to short telephoto 27-157.5mm equivalent focal length that works for anything from vast landscapes to tight portraits to distant subjects. Three aspherical elements, including one Advanced Aspherical (AA), are incorporated in the lens design to reduce astigmatism, field curvature, coma, and other monochromatic aberrations. Enjoy smooth zooms ideal for shooting movies with the power zoom mechanism which uses Handycam technology from Sony's well-regarded camcorders. An internal focus design contributes to fast autofocus speeds and the minimum focus distance of 1.5' and easier handling as the lens maintains its overall length. The Watson NP-FW50 Lithium-Ion Battery Pack works with the same cameras as the Sony NP-FW50. This replacement battery pack features a capacity of 1100mAh, 7.4V of output power and 8.14 watt-hours. Small and lightweight, lithium-ion batteries can be charged or discharged at any time without developing memory effect. This versatile Compact AC/DC Charger from Watson charges any NP-FW50 lithium-ion battery via the included, dedicated battery plate. The charger runs on 100-240 VAC power, allowing for worldwide use. It features a fold-out, 2-prong US plug and is supplied with a European plug adapter, as well as a 12 VDC car charger that plugs into a cigarette lighter. This makes it ideal for use both at home and on the road. The Compact AC/DC Charger features a USB output that allows you to charge and power MP3 players, phones, digital cameras, and other devices with a USB power input - even while charging your camera or camcorder batteries. As the adapter plates are easily interchangeable, the charger can also be used with other batteries via the purchase of the required plates. Compatible with any Sony NP-FW50 type battery. The 72mm 98-UVATS UV Filter is one of Chiaro’s highest-rated protective UV filters with 98% light transmission. It’s ideal for photographers of all levels who demand high-quality glass and other essential features for excellent image fidelity and construction. To achieve 98% light transmission, Chiaro uses highly-polished optical glass, multi-coating, and additional advanced elements that improve the filter’s light transmission. A scratch-resistant coating minimizes scratching of the glass and helps assure that water, oil, dust, and fingerprints are removed with a gentle wipe. Its hard-anodized aluminum filter ring is designed to screw on and off effortlessly, and it is thin to prevent vignetting when used with wide-angle lenses. Side knurling helps assure that you’ll have a firm grip when attaching or removing your filter. Image quality is what matters most at Chiaro. The company has tested and combined many features and essentials to achieve superior image quality and the highest light transmission. To help take the confusion out of selecting a filter, Chiaro prominently displays the light transmission levels so that you can choose the perfect filter for your lens and photo session. Protecting your lens doesn't mean you have to lose optical quality. By using highly-polished optical glass and advanced coatings, Chiaro offers a 98% transmission rate, which is an excellent transmission rate for glass. And the company verifies the ratings with ISO certified lab testing. The layers of advanced resistance coating on the filter are designed to resist moderate scratches, and allows you to easily clean your filter. Water beads up and rolls off your filter, and oil and fingerprints can come off with a gentle wipe. Dust and debris won't adhere to the filter and can be removed with a puff of air. Glass that's polished to perfection is essential to achieve a high level of light transmission. The optical glass in this Chiaro filter is highly-polished for flatness that ensures excellent optical clarity. Multi-coating enhances light transmission to the demanding level set for all Chiaro filters. It reduces unwanted internal reflections and ghosting that can compromise your images. The process of hard anodizing toughens and strengthens the aluminum for a lightweight yet durable filter ring. In addition to top knurling, Chiaro added side knurling that helps offer better options to grip the filter when you're attaching and removing it, or when you're stacking filters. It takes two full turns to mount the filter on your lens. This feature will securely hold your Chiaro filter through the most demanding photo shoots. The front threads on the filter allow you to stack filters by screwing them onto your Chiaro filter. Box Dimensions (LxWxH) 6.2 x 5.7 x 5.2"
Box Dimensions (LxWxH) 6.8 x 4.2 x 3.9"
Box Dimensions (LxWxH) 5.4 x 3.2 x 1.1"
Box Dimensions (LxWxH) 6.4 x 4.6 x 2.0"
Box Dimensions (LxWxH) 3.7 x 3.7 x 0.7"